Setting: Peter was probably in Rome when the great persecution under Emperor Nero bean. (Eventually Peter was executed during this persecution.) Throughout the Roman Empire, Christians were being tortured and killed for their faith, and the church in Jerusalem was being scattered. Key verse: "These trials will show that your faith is genuine... So when your faith remains strong through many trials, it will bring you much praise and glory and honor on the day when Jesus Christ is revealed to the whole world" (1:7). Special features: Peter used several images that were very special to him because Jesus had used them when he had reveled certain truths to Peter. Peter's name (which means "rock") had been given to him by Jesus. Peter's conception of the church- a spiritual house composed of living stones built upon Christ as the foundation - had come from Christ. Jesus had encouraged Peter to care for the church as a shepherd tending the flock. Thus, it is not surprising to see Peter using living stones (2:5-9) and shepherds and sheep (2:25; 5:2, 4) to describe the church. New Geneva study Bible. 1997, c1995 (electronic ed.) (1 P 2.13). Nashville: Thomas Nelson. New Geneva study Bible. 1997, c1995 (electronic ed.) (1 P 5.13). Nashville: Thomas Nelson. 3. 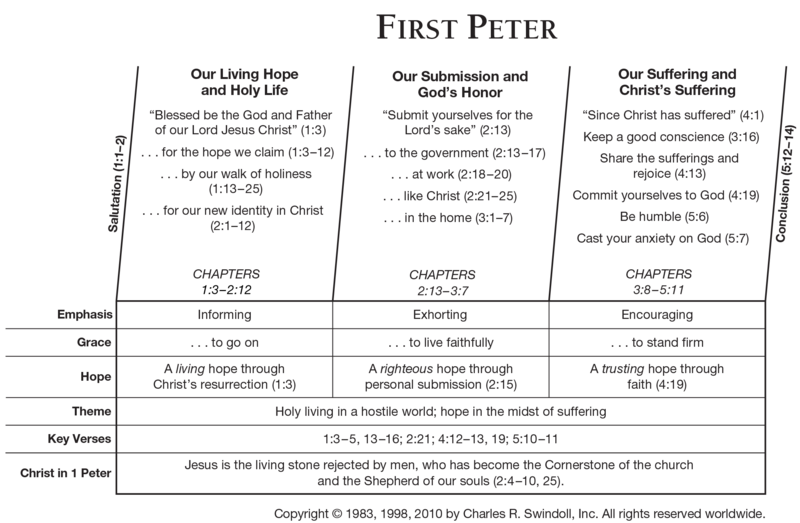 The shepherding of God's people in the midst of suffering (5:1-14) Peter wrote to Jewish Christians who were experiencing persecution for their faith. He wrote to comfort them with the hope of eternal life and to challenge them to continue living holy lives. Those who suffer for being Christians become partners with Christ in his suffering. As we suffer, we must remember that Christ is both our hope in the midst of suffering and our example of how to endure suffering faithfully.